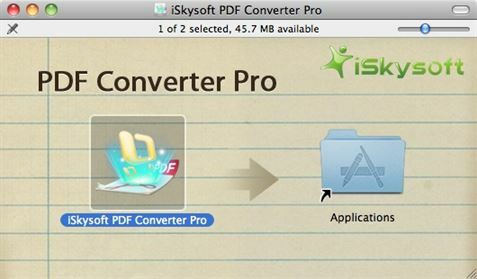 Download iSkysoft PDF Converter Pro and install it on your Mac. Double-click the .dmg file to start the program. 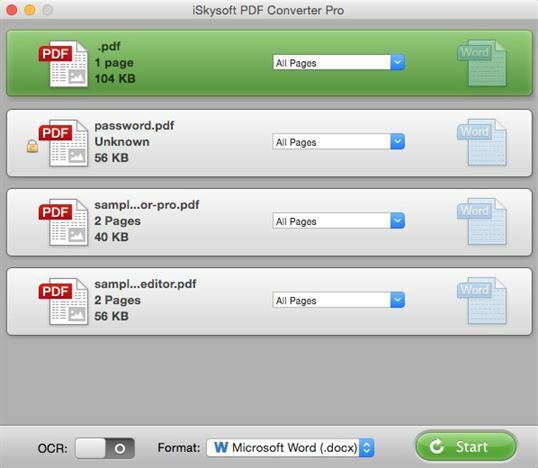 To import PDF files, just drag and drop PDF files to the PDF Converter Pro. Batch conversion is supported, so you can import as many as 200 files at a time. Once the files have been added, choose your desired format (one format per conversion batch) by clicking the settings button on each item. Retain value without formatting: The default option, this option preserves all original text, graphs and numerals in PDF tables to a corresponding Excel sheet, without preserving the original formatting. Retain original formatting of forms: This option allows you to preserve text, numbers and formatting from the original PDF file. This option is unsuitable for some irregular PDF tables, as there might be some positioning errors that may affect the usual calculations after conversion. 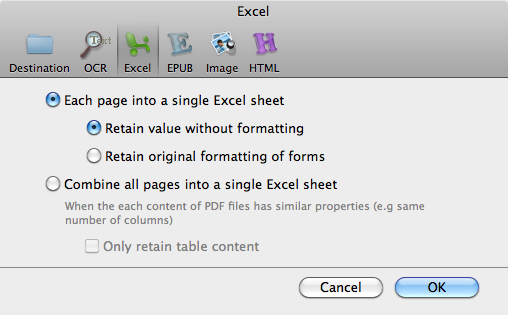 Combine All Pages into a single Excel Sheet: This option allows you to export multiple PDF files into a single Excel page. Text and images to EPUB: This option converts the text and images of the original PDF file to EPUB format. Users are then able to copy text or save images from the converted EPUB files. 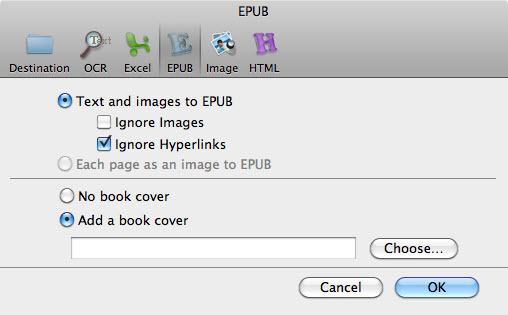 Each page as an image to EPUB: This option converts each page of a PDF file, text and pictures as images only. The converted file looks the same as the PDF, but users cannot copy the text or save images. Note: There is also an option for you to add a cover for the EPUB eBook here. Each page of the PDF file as an image: It means each page of a PDF file be saved as an image. Extract all images in the PDF file: This option means all the images in the PDF file will be extracted and saved. Text and images to HTML: This option makes the output text and images in HTML editable. Each page as an image to HTML: It means each page of a PDF file will be exported as HTML pages and editing is not allowed. If you're going to convert scanned PDF files, please tick the option "Convert scanned PDF documents with OCR" right at the bottom of the main interface. Only after you tick the option, the OCR function is enabled. 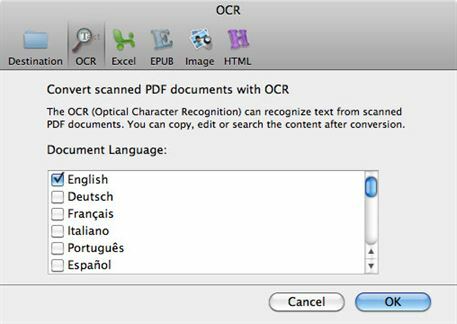 And then you should go to PDF Converter Pro>Preferences, under the OCR option, select the OCR recognition language. Once the conversion options are set, click the Convert button. 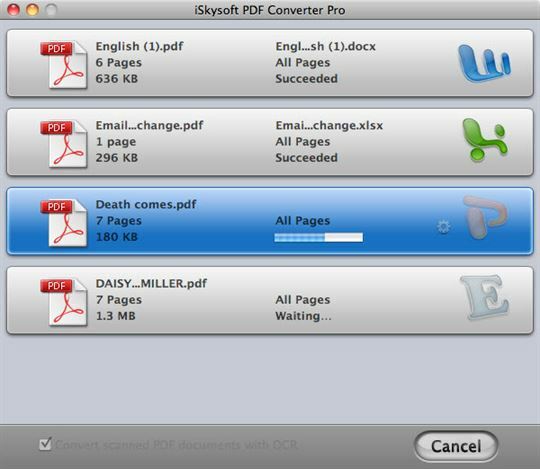 For these PDF files that are protected from copying and printing, just import them into the PDF Converter Pro for Mac, select the output format and click the Convert button to convert them into other documents you desired. 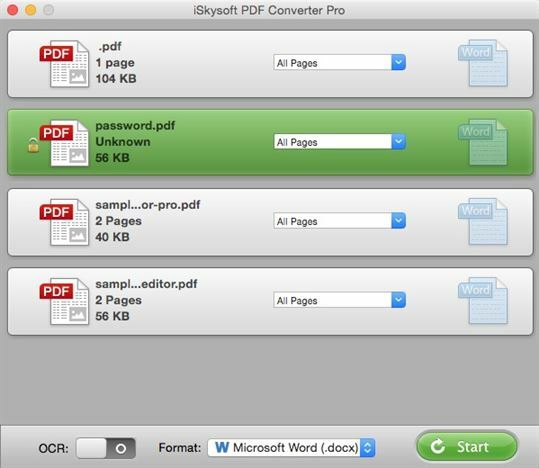 For these Open Password protected PDF files, after you upload them to the program, click the lock icon and key in the right password to unlock them. Then select the output format and click the Convert button to start the conversion.